When blessing the home, whether it is a new one, or it is a re-blessing of the current home, a witch’s first job, after the cleansing and purifying of the home, is to determine what blessings they intend to draw into the home. After all, blessing the home is not a “one size fits all” endeavor. Some witches among us may choose to bless the home with child or baby blessings, prosperity, marital bliss, and protection. Other witches among us may choose to bless the home with magicks, spell work, divination, spirit working, and protection. Still more witches may choose to imbue their homes with the blessings of friendship, luck, success, and protection. Just as every witch is unique, so are the individual needs of every witch and every witch’s home. Whether there is a family sharing the home, a roommate, or a single witch, focused on using and strengthening their specific gifts; the most important thing is to tailor the blessings drawn into each home to meet the needs of the people inside that individual home. After all, any Taitsu, Hassan or Moshe may bless a home according to various and assorted spiritual beliefs, be they Christian, Buddhist, Jewish, Muslim, etc. However, only a witch should bless a witch’s home. Why? Because, even though some witches also practice a religious faith alongside their magickal craft, a simple but traditional blessing from many of the world religions, or their chosen religion in particular, may prevent portions of their craft from working, as it should. Especially since most religions seal the homes to spirits and thus nullify the spirit work that many witches perform. Yet, practicing witches know which herbs to use to draw specific blessings into the home and to surround the home. We know which metals or which stones to place inside the home or outside the home to pull in specific blessings. Just as when preparing a new home prior to moving in, during the cleansing phase, a witch cannot go wrong when adding a few tablespoons of New Moon Water to their cleansing products to get rid of negativity. As such, during the blessings phase using specific Moon Waters may serve as a base to create the Holy Water used during the blessings phase, if that specific witch uses Holy Water in blessing the home. Starting the process by making certain the space is clean and uncluttered and including the Sweep Away Negativity Spell, and cleaning the space via ritual cleansing and purifying of the home as we previously posted. When re-blessing an existing home, choose your preferred season to bless your home based on what purpose and intent you have for your home. Personally, I suggest autumn if you plan to do it annually, instead of seasonally, as I do. Autumn is the season for working on magickal protection for yourself and your beloveds, as well as for spells focusing on prosperity, wealth, and success, but if you want to bless your home specifically for friendship, healing, love or marriage, etc, you will want to target the blessings to the appropriate season. Witches may even choose to narrow the focus to a specific day for blessing the home if there is a specific need. For example, if someone has been recently diagnosed with a serious disease and the household is going to start working toward the good health of that family member, planning to bless the home on a Saturday when the moon is waning would be ideal. You are not going to want to wait until springtime, which is the time for healing in body and mind, even though the focus is healing, but targeting the blessing for specific day and moon phase will strengthen the magickal working. You may choose to create a house talisman or two to hang over the main entrance doors using various mediums. If you choose to, you might wrap an iron nail, with bits of copper, silver, and/or tin, charge it, and hang it over your entrance to draw their specific properties into your home. Create a personal sigil from your desires for the home, such as: “Protection, Prosperity and Peace” to mark on all doors of the home using Holy Water and let it sink into the doors or air dry upon them to become a part of them. Some witches may choose to use an Anointing Oil to mark the sigil or even a preferred protection rune and/or holy symbol into each door and/or window of your home. For protection for the home from the outside, the witch may bless and bury a piece of fluorite along with other chosen stones in each quarter of the yard, starting East, South, West then North, and weave the properties of the stones into your protection and blessing spell for of the home. Walk the outdoor perimeter of the home and the outer perimeter of the yard while scattering what I refer to as the “grocery store blend” of protective herbs: basil, cinnamon, cloves, coriander, garlic, and rosemary. Easily grown in your own garden, purchased from local occult stores or even your local grocery store, once cleansed and purified for magickal use, these herbs are wonderful for protecting against a multitude of harms. Choosing the candle color(s) based on the properties of the blessings that the witch wants to draw into their home and inscribing them with rune, glyphs, and/or sigils to enhance those properties. Writing out a spell for blessings on parchment to carry and recite in each room before it is “bound and burned” by a colored candle in the center of the home. Witches can add extra layers of power to the blessings by using the Holy Water in their cauldron (if cauldron is “positively” charged) and using fresh springs of basil, pine, or rosemary as aspergillums for the Holy Water. Burning incense specially created for the blessing or general blessing incense can add another layer. As always, it is only the limits of the witch’s imagination that will limit the blessing ritual for the home. If you can think it, you can do it. Be a creative witch and see how many layers of blessings you can work into your own personal ritual to bless your home! 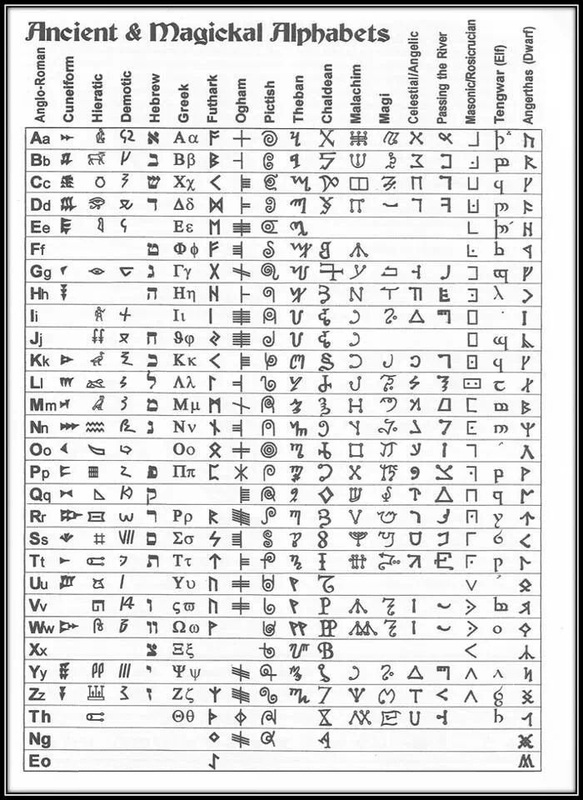 Throughout history various cultures have developed means of writing down symbols to represent the sounds used to express ideas. Here are examples of a few of them. 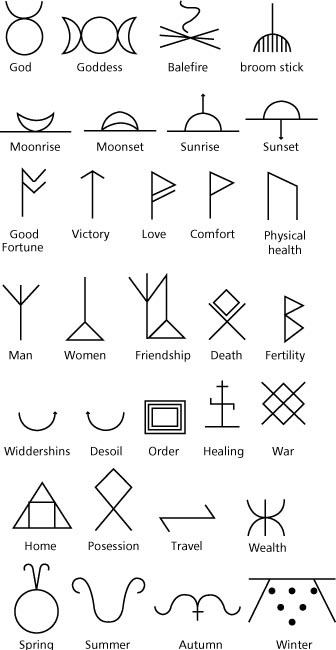 Glyphs are handy tools for witches to use for so many magickal purposes. Carve one into a specific colored candle, charge the glyph and the candle to a particular use and viola; you have a powerful spell candle. Add protective glyphs in Holy Water to your vehicle and home to aid in protecting them. For that matter, use glyphs on the jars you collect your Moon Waters in to enhance the magick of the waters. Use glyphs in the corners of written spells to increase their potency. As a witch, I feel that adding glyphs, runes, and sigils to different magickal spell practices, merely adds another layer of power into the spell. So, for MJ, who requested a few more glyphs, here you go!